Copyright Notice. The electronic materials in this web pages are presented to ensure timely dissemination of scholarly and technical work. Copyright and all rights therein are retained by authors or by other copyright holders. All persons copying this information are expected to adhere to the terms and constraints invoked by each author's copyright. In most cases, these works may not be reposted without the explicit permission of the copyright holder. P. Flocchini, G. Prencipe, N. Santoro. Moving and Computing Models: Robots. 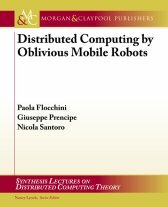 in "Distributed Computing by Mobile Entities", P. Flocchini, G. Prencipe, N. Santoro (Eds. 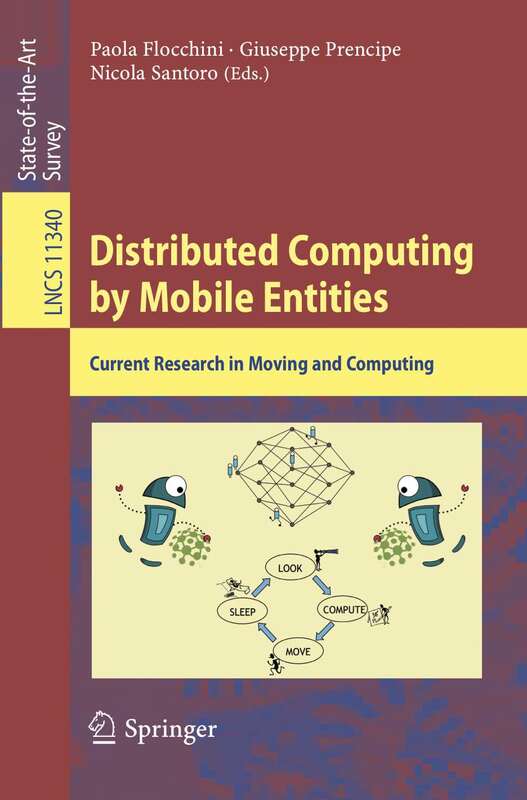 ), Springer, 2019.
in "Mobile Agents in Networking and Distributed Computing", J. Cao and S. Das Eds, John Wiley ISBN: 978-0-471-75160-1, 41-70, 2012.
in "Theoretical Aspects of Distributed Computing in Sensor Networks", S. Nikoletseas and J. Rolim Eds, Springer, 655-693, 2011. Encyclopedia of Algorithms, 1264-1268, 2016. Encyclopedia of Algorithms, 2297-2301, 2016. 14th International Conference on Ad-hoc, Mobile, and Wireless Networks (ADHOC-NOW), 238-252, 2015. Commissioned by Defense Research and Development Canada (DRDC), 82 pages, 2013. Commissioned by Defense Research and Development Canada (DRDC), 92 pages, 2013. G.A. Di Luna, P. Flocchini, L. Pagli, N. Santoro, G. Viglietta. Gathering in dynamic rings Theoretical Computer Science (accepted), 2019. G.A. Di Luna, P. Flocchini, T. Izumi, T. Izumi, N. Santoro, G. Viglietta. Population protocols with faulty interactions: the impact of a leader Theoretical Computer Science, 35-49, 2019. G. Di Luna, S. Dobrev, P. Flocchini, N. Santoro. Distributed exploration of dynamic rings Distributed Computing 1-27, 2018. P. Flocchini, G. Prencipe, N. Santoro, G. Viglietta. Distributed computing by mobile robots: uniform circle formation Distributed Computing, 30(6): 413-457, 2017. Mutual visibility by luminous robots without collisions. Information and Computation, 254: 392-418, 2017. A. Afrasiabi Rad, P. Flocchini, J. Gaudet. Computation and analysis of temporal betweeness in a knowledge mobilization network. Computational Social Networks, 2017. P. Flocchini, N. Santoro, G. Viglietta, M. Yamashita. Rendezvous with Constant Memory. Theoretical Computer Science, 621: 57-72, 2016. B. Balamohan, S. Dobrev, P. Flocchini, N. Santoro. Exploring an unknown dangerous graph with a constant number of tokens. Theoretical Computer Science, 610:169-181, 2016. P. Flocchini, F. Luccio, L. Pagli, N. Santoro. Network decontamination under m-immunity. Discrete Applied Mathematics, 201: 114-129, 2016. A. Casteigts, P. Flocchini, E. Godard, N. Santoro, M. Yamashita. On the Expressivity of Time-Varying Graphs. Theoretical Computer Science, 590: 27-37, 2015. A. Casteigts, P. Flocchini, B. Mans, N. Santoro. Shortest, Fastest, and Foremost Broadcast in Dynamic Networks. International Journal of Foundations of Computer Science, 26(4): 499-522, 2015. Measuring Temporal Lags in Delay-Tolerant Networks. IEEE Trans. Computers, 63(2): 397-410, 2014. J. Cai, P. Flocchini, N. Santoro. Decontaminating a Network from a Black Virus. International Journal of Networking and Computing, 4(1): 151-173, 2014. H. Betel, P.P.B. De Oliveira, P. Flocchini. Solving the parity problem in one-dimensional cellular automata, Natural Computing, 2013. On the exploration of time-varying networks, Theoretical Computer Science, 469: 53-68, 2013. P. Flocchini, D. Ilcinkas, A. Pelc, N. Santoro. Computing Without Communicating: Ring Exploration by Asynchronous Oblivious Robots, Algorithmica, 65(3): 562-583, 2013. S. Dobrev, P. Flocchini, Rastislav Kralovic, N. Santoro. Exploring an Unknown Dangerous Graph Using Tokens, Theoretical Computer Science, 472: 28-45, 2013. Ping pong in dangerous graphs: optimal black hole search with pebbles, Algorithmica 62 (3-4), pag. 1006-1033, 2012. P. Flocchini, T. Mesa, L. Pagli, G. Prencipe, N. Santoro. Distributed minimum spanning tree maintenance for transient node failures, IEEE Transactions on Computers, 61(3): 408-414, 2012. A. Casteigts, P. Flocchini, W. Quattrociocchi, N. Santoro. Time-Varying Graphs and Dynamic Networks, International Journal of Parallel, Emergent and Distributed Systems 27(5): 387-408, 2012. P. Flocchini, M. Kellett, P.C. Mason, N. Santoro. Searching for Black Holes in Subways, Theory of Computing Systems 50(1), pag. 158-184, 2012. P. Flocchini, D. Ilcinkas, A. Pelc and N. Santoro. How many oblivious robots can explore a line, Information Processing Letters 111(20):1027-1031, 2011. B. Balamohan, P. Flocchini, A. Miri, N. Santoro. L. Barriere, P. Flocchini, E. Mesa-Barrameda, N. Santoro. Uniform scattering of autonomous mobile robots in a grid, International Journal of Foundation of Computer Science, 22(3): 679-697 2011. Remembering without memory: tree exploration by asynchronous oblivious robots, Theoretical Computer Science, 411, 1583-1598, 2010. Fault-tolerant sequential scan. Theory of Computing Systems, 1-26, 2009. Radial View of Continuous Cellular Automata Fundamenta Informaticae, 87(2): 165-183, 2008. P. Flocchini, L. Pagli, G. Prencipe, N. Santoro, P. Widmayer. Computing all the best swap edges distributively, Journal of parallel and distributed computing, 68(7): 976-983, 2008. S. Das, P. Flocchini, S. Kutten, A. Nayak, N. Santoro. Map Construction of Unknown Graphs by Multiple Agents, Theoretical Computer Science , 385(1-3): 34-48, 2007. Optimal construction of sense of direction in a torus by a mobile agent. International Journal of Foundation of Computer Science, 18(3), 529-546, 2007. Enhancing peer-to-peer systems through redundancy. IEEE Journal on Selected Areas in Communications, 25(1), 15-24, 2007. Point-of-failures shortest path rerouting: computing the optimal swaps distributively, IEICE Transactions on Information and Systems, vol. E89-D, n. 2, 700-708, 2006. Sorting and election in anonymous asynchronous rings, Journal of Parallel and Distributed Computing , vol. 64:2, 254-265, 2004. Dynamic Monopolies in Tori, Discrete Applied Mathematics , vol. 137, 197-212, 2004. A New Compact Routing Technique on Series-Parallel Networks, Theory of Computing Systems , vol. 36, 137-157, 2003. Computing in anonymous networks with sense of direction, Theoretical Computer Science. 301, 355-379, 2003. P. Flocchini, F. Geurts, A. Mingarelli, N. Santoro. Symmetries and Sense of Direction in Labeled Graphs Discrete Applied Mathematics, vol. 87, p. 99-115, 1998. Sense of direction: definitions, properties, and classes, Networks, 32(3), p. 165-180, 1998. On the Impact of Sense of Direction on Message Complexity Information Processing Letters, vol. 63, 23-31,1997. Minimal Sense of Direction in Regular Networks Information Processing Letters, vol. 61, 331-338, 1997. CA-like evolution of a spontaneous overflow error, Parallel Computing, vol. 23, n. 11, 1673-1682, 1997. Cellular automata in fuzzy backgrounds, Physica D, vol. 105, 105-120, 1997. Optimal election in labeled hypercubes Journal of Parallel and Distributed Computing, vol. 33, n. 1, 76-83, 1996. Finding the Extrema of a Distributed Multiset Journal of Parallel and Distributed Computing, vol.37, 123-133,1996. Pattern growth in elementary cellular automata, Theoretical Computer Science, vol. 145, 1-26, 1995. Complex chaotic behavior of a class of subshift cellular automata, Complex Systems, vol. 7, 269-296, 1993. G.A. Di Luna, P. Flocchini, N. Santoro, G. Viglietta. TuringMobile: a Turing machine of oblivious mobile robots with limited visibility and its applications DISC 2018. E. Omar, P. Flocchini, N. Santoro. Energy restoration in a linear sensor network, 15th International Conference on Computer Systems and Applications, 2018. Online energy restoration by a mobile robot in a ring of sensors, 654-659, IWCMC, 2018. Line-recovery by programmable particles. (extended version) ICDCN 2018. G.A. Di Luna, P. Flocchini, N. Santoro, G. Viglietta, Y. Yamauchi. Shape formation by programmable particles. OPODIS 2017. J-L. De Carufel, P. Flocchini. Fault-induced dynamics of oblivious robots on a line. SSS 2017. G.A. Di Luna, P. Flocchini, N. Santoro, G. Viglietta, M. Yamashita. Meeting in a polygon by anonymous oblivious robots. DISC 2017. Gathering in dynamic rings, 24th International Colloquium on Structural Information and Communication Complexity (SIROCCO) 2017. (extended version). Population protocols with faulty interactions: the impact of a leader. 10th International Conference on Algorithms and Complexity (CIAC), 2017. On the Power of Weaker Pairwise Interaction: Fault-Tolerant Simulation of Population Protocols. 37th IEEE International Conference on Distributed Computing Systems (ICDCS), 2017. S. Das, G.A. Di Luna, P. Flocchini, N. Santoro, G. Viglietta. Mediated population protocols: leader election and applications. 14th annual Conference on Theory and Applications of Models of Computation (TAMC), 2017. G. A. Di Luna, S. Dobrev, P. Flocchini, N. Santoro. Live Exploration of Dynamic Rings, 36th IEEE International Conference on Distributed Computing Systems (ICDCS), 2016 (extended version). P. Flocchini, N. Santoro, G. Viglietta and M. Yamashita. Universal Systems of Oblivious Mobile Robots, 23rd International Colloquium on Structural Information and Communication Complexity (SIROCCO), 2016. G.A. Di Luna, P. Flocchini, G. Prencipe, N. Santoro and G. Viglietta. A Rupestrian Algorithm, 8th International Conference on FUN with Algorithms, 1-20, 2016. Computations by Luminous Robots. 14th International Conference on Ad-hoc, Mobile, and Wireless Networks (ADHOC-NOW), 238-252, 2015. Tempus Fugit: The Impact of Time in Knowledge Mobilization Networks, ASONAM, 1523-1530, 2015 (extended version). Distributed Black Virus Decontamination and Rooted Acyclic Orientations. 15th IEEE International Conference on Computer and Information Technology, 1681-1688, 2015. Distributed Computing by Mobile Robots: Solving the Uniform Circle Formation Problem. 18th International Conference on Principles of Distributed Systems (OPODIS), 2014. M. Eftekhari, P. Flocchini, L. Narayanan, J. Opatrny, N. Santoro. Distributed Barrier Coverage with Relocatable Sensors, 21st Int. Symposium on Structural Information and Communication Complexity (SIROCCO), 235-249, 2014. G.A. Di Luna, P. Flocchini, S.G. Chaudhuri, N. Santoro, G. Viglietta. Robots with Lights: Overcoming Obstructed Visibility Without Colliding Proc. 16th Int. Symposium on Stabilization, Safety, and Security of Distributed Systems (SSS), 150-164, 2014. S. Das, P. Flocchini, G. Prencipe, N. Santoro. Synchronized Dancing of Oblivious Chameleons Proc. 6th International Conference on FUN with Algorithms 113-124, 2014. Rendezvous of Two Robots with Constant Memory, 20th Int. Symposium on Structural Information and Communication Complexity (SIROCCO), 2013. Network Decontamination from a Black Virus. IPDPS Workshop on Advances in Parallel and Distributed Computational Models, 696-705, 2013. On the Parity Problem in One-dimensional Cellular Automata, Proc. 18th International Workshop on Cellular Automata and Discrete Complex Systems (AUTOMATA), 2012. The Power of Lights: Synchronizing Asynchronous Robots using Visible Bits, Proc. 32nd International Conference on Distributed Computing Systems (ICDCS), 2012. P. Flocchini, M. Kellett, P. Mason, N. Santoro. Finding Good Coffee in Paris, Proc. 6th International Conference on FUN with Algorithms 154-165, 2012. Asynchronous exploration of an unknown anonymous dangerous graph with O(1) pebbles, Proc. 19th Int. Colloquium on Structural Information and Communication Complexity (SIROCCO), 279--290, 2012. P. Flocchini, M. Kellett, P. C. Mason, N. Santoro. Fault-Tolerant Exploration of an Unknown Dangerous Graph by Scattered Agents, 14th Int. Symposium on Stabilization, Safety, and Security of Distributed Systems (SSS), 299-313, 2012. Time-Varying Graphs and Dynamic Networks. ADHOC-NOW, pag. 346-359, 2011. Measuring temporal lags in delay-tolerant networks 25th IEEE International Parallel & Distributed Processing Symposium (IPDPS), 209-218, 2011. Santoro, W. Quattrociocchi, P. Flocchini, A. Casteigts, F. Amblard. Time-Varying Graphs and Social Network Analysis: Temporal Indicators and Metrics 3rd AISB Social Networks and Multiagent Systems Symposium (SNAMAS), 32-38, 2011. Improving the Optimal Bounds for Black Hole Search in Rings, Proc. 18th International Colloquium on Structural Information and Communication Complexity (SIROCCO), 198-209, 2011. F. Amblard, A. Casteigts, P. Flocchini, W. Quattrociocchi, N. Santoro. On the temporal analysis of scientific network evolution. CASoN, Pag. 169-174, 2011. Time optimal algorithms for black hole search in rings, 4th Int. Conf. on Comb. Optimization and App. (COCOA), pag. 58-71, 2010. S. Das, P. Flocchini, N. Santoro, M. Yamashita. On the computational power of oblivious robots: forming a series of geometric patterns, 29th ACM Symposium on Principles of Distributed Computing (PODC), 267-276, 2010. Y. Daada, P. Flocchini, N. Zaguja. Network decontamination with temporal immunity by cellular automata, 9th Int. Conference on Cellular Automata for Research and Industry (ACRI), 287-299, 2010. J. Chalopin, P. Flocchini, B. Mans, N. Santoro. Network exploration by silent and oblivious robots, 36th Int. Workshop on Graph Theoretic Concepts in Computer Science (WG), 208--216, 2010. Deterministic computations in time-varying graphs: broadcasting under unstructured mobility, 6th IFIP Int. Conference on Theoretical Computer Science, 2010. Mapping an unfriendly subway system, 3rd Int. Conference on FUN with Algorithms, 190-201, 2010. Exploration of Periodically Varying Graphs ISAAC 2009 . Map Construction, Spanning Tree Construction, and Election by Scattered Agents in Dangerous Networks IPDPS 2009 . Ping pong in dangerous graphs: optimal black hole search with pure tokens DISC 2008 ). Remembering without memory: tree exploration by asynchronous oblivious robots, extended version of: Proc. Int. Colloquium on Structural Information and Communication Complexity, 33-47, SIROCCO 2008. Computing without communicating: ring exploration by asynchronous oblivious robots Proc. 11th International Conference On Principles Of Distributed Systems OPODIS 2007. A decentralized solution for locating mobile agents, Proc. Euro-Par 2007. Distributed computation of all node replacements of a minimum spanning tree, Proc. Euro-Par 2007. S. Das, P. Flocchini,N. Santoro, M. Yamashita. Fault-tolerant simulation of message-passing algorithms by mobile agents, Proc. of 14th International Colloquium on Structural Information and Communication Complexity , (SIROCCO), 2007. P. Flocchini, A. Nayak, A. Shulz. Decontamination of arbitrary networks using a team of mobile agents with limited visibility, Proc. IEEE International Conference on Computer & Information Science, 2007. Distributed security algorithms for mobile agents, Proc. 8th International Conference on Distributed Computing and Networking (ICDCN 2006). S. Das, P. Flocchini, A. Nayak,N. Santoro. Effective elections for anonymous mobile agents, Proc. 17th International Symposium on Algorithms and Computation (ISAAC 2006). Self-Deployment Algorithms for Mobile Sensors on a Ring, Proc. 2nd International Workshop on Algorithmic Aspects of Wireless Sensor Networks, (ALGOSENSORS 2006). S. Dobrev, P. Flocchini, R. Kralovic, N. Santoro. Exploring a dangerous unknown graph using tokens, Proc. of 5th IFIP International Conference on Theoretical Computer Science (TCS 2006). S. Dobrev, P. Flocchini, N. Santoro. Cycling through a dangerous network: a simple efficient strategy for black hole search, Proc. of 26th International Conference on Distributed Computing Systems (ICDCS 2006). Decontamination of chordal rings and tori, Proc. of 8th Workshop on Advances in Parallel and Distributed Computational Models (APDCM 2006). Optimal map construction of an unknown torus Proc. of 8th Workshop on Advances in Parallel and Distributed Computational Models (APDCM 2006). P. Flocchini, M. J. Huang, F.L. Luccio. Contiguous search in the hypercube for capturing an intruder, Proc. of 18th IEEE Int. Parallel and Distributed Processing Symposium (IPDPS 2005). S. Das, P. Flocchini, A. Nayak, N. Santoro. Distributed exploration of an unknown graph, Proc. of 12th Int. Colloqium on Structural Information and Communication Complexity (SIROCCO 05). P. Flocchini, F.L. Luccio, L. Song. Size optimal strategies for capturing an intruder in mesh networks, Proc. of International Conference on Communications in Computing (CIC 2005). P. Flocchini, A. Nayak, A. Schulz. Cleaning an Arbitrary Regular Network with Mobile Agents , 2nd International Conference on Distributed Computing & Internet Technology (ICDCIT 2005) 132-142. Computing All the Best Swap Edges Distributively, In Proc. of Symposium on Principles of Distributed Systems (OPODIS 2004). Multiple agents rendezvous on a ring in spite of a black hole , In Proc. of Symposium on Principles of Distributed Systems (OPODIS2003). Solving the robots gathering problem , In Proc. of 30th International Colloquium on Automata, Languages and Programming, (ICALP20003). Election and rendezvous in fully anonymous networks with sense of direction, Proc. of 10th International. Colloquium on Structural Information and Communication Complexity (SIROCCO 2003). Optimal search for a black hole in common interconnection networks, Proc. of Symposium on Principles of Distributed Systems (OPODIS 2002), 2002. Capture of an Intruder by Mobile Agents , Proc. of 2002 Symposium on Parallel Algorithms and Architectures (SPAA 2002). Pattern Formation by Anonymous Robots Without Chirality, Proc. 8th International Colloquium on Structural Information and Communication Complexity (SIROCCO 2001), 147-162, 2001. Gathering of asynchronous mobile robots with limited visibility , Proc. of International Symposium Theoretical Aspects of Computed Science (STACS 2001), Lecture Notes in Computer Science, Vol. 2010, 247-258, Dresden, 2001. Distributed coordination of a set of autonomous mobile robots Proc. of IEEE Intelligent Vehicles Symposium (IV 2000), Dearborn, USA, 480-485, 2000. Sorting multisets in anonymous rings, Proc. International Parallel and Distributed Processing Symposium (IPDPS 2000), Cancun, 275-280, 2000. On time versus size for monotone dynamic monopolies in regular topologies, Proc. 7th Coll. on Structural Information and Communication Complexity (SIROCCO 00), L'Aquila, 111-126, 2000. Hard tasks for weak robots, Proc. of 10th International Symposium on Algorithm and Computation (ISAAC 99), Chennai, 1999. Biconsistency and Homonymy in Distributed Systems with Edge Symmetry, Proc. of 3rd International Conf. on Principles of Distributed Systems (OPODIS 99), Hanoi, 29-46, 1999. Irreversible dynamos in chordal rings, Proc. 25th International Workshop on Graph-Theoretic Concepts in Computer Science (WG 99), Ascona, 1999. Monotone dynamos in Tori, Proc. 6th Colloquium on Structural Information and Communication Complexity (SIROCCO 99), Lacanau, 152-165, 1999. Sense of Direction and Backward Consistency in Advanced Distributed Systems, Proc. 18th ACM Symposium on Principles of Distributed Computing (PODC 99), Atlanta, 89-98, 1999. Distributed Objects with sense of direction, Proc. Workshop on Distributed Data and Structures, Orlando, 1-15, 1998. Sense of Direction in Distributed Computing, Proc. of 12th International Symposium on Distributed Computing (DISC 98), Andros, 1-15, 1998. Levels of sense of direction. Proc. 1st International Conference on Principles of Distributed Systems (OPODIS 97), Chantilly, 319-331, 1997. Efficient parallel graph algorithms for coarse grained multicomputers and BSP, Proc. of ICALP '97, 390-400, 1997. Complete symmetries and minimal sense of direction in labeled graphs. Proc. 27th SE Conference on Combinatorics, Graph Theory and Computing, Baton Rouge 1996; in Congressus Numerantium, vol. 121, 3-18, 1996. Distance routing on series parallel networks, Proc. 16th IEEE International Conference on Distributed Computing Systems, (ICDCS96) Hong Kong, 352-359, 1996. Computing in anonymous networks with sense of direction, Proc. 3rd Colloquium on Structural Information and Communication Complexity, (SIROCCO 96) 32-46, Siena, 1996. Sense of direction, associativity, and symmetricity in distributed systems, Proc. 26th SE Conference on Combinatorics, Graph Theory and Computing, Boca Raton, 1995; in Congressus Numerantium, vol 110, 49-63, 1995. Translation properties of sense of direction, Proc. 2nd Colloquium on Structural Information and Communication Complexity, (SIROCCO 95) Olympia, 4-21, 1995. Topological constraints for sense of direction, Proc. 2nd Colloquium on Structural Information and Communication Complexity, (SIROCCO 95) Olympia, 22-37, 1995. Dynamics and algebraic properties of reinforced shifts, Proc. International Symposium on Nonlinear Theory and Its Applications, Las Vegas, vol. 2, 1149--1152, 1995. An effective classification of elementary cellular automata, Proc. National Workshop on Nonlinear Dynamics, vol. 48, 69-78, 1995. Sense of direction: formal definitions and properties, Proc. 1st Colloquium on Structural Information and Communication Complexity, (SIROCCO 94) Ottawa, 9-33, 1994. A new classification of cellular automata and their algebraic properties, Proc. International Symposium on Nonlinear Theory and Its Applications, Waikiki, 223--226, 1993.